Pilots at UK airline Bmibaby are being balloted for a possible strike over pay that could take place around August Bank Holiday. The ballot by pilots' union Balpa will initially only cover Bmibaby - BMI's no-frills arm - but could be extended to its regional and long-haul carriers. Heathrow and Manchester could be among the airports affected if a BMI-wide strike in August's peak season ensues. The move comes as Balpa says a pay increase was "imposed" on members. Disputes at Bmibaby, BMI Mainline and BMI Regional - though separate - all address the issue of pay. "At the heart of these disputes is the total lack of respect shown by the company towards its key people... the airline pilots," said Jim McAuslan, general secretary of Balpa. Meanwhile, Bmibaby's management says it is "hopeful" that pilots will reject the strike and take the 2.4% pay increase other employees have accepted. The union has given BMI seven days' notice that it intends to ballot pilots for strike action at the firm's other two divisions - BMI Mainline and BMI Regional. The result of the Bmibaby pilots' ballot will be made public on 16 August. 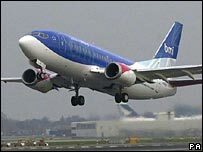 As well as Heathrow and Manchester, the BMI group - which served 10.5 million passengers in 2005 - offers flights from Gatwick, Newcastle, Norwich, Southampton, Stornoway, Cardiff, Birmingham, East Midlands and Teesside airports.